The Mooncow Project - "Nandi"
The Mooncow Project is a spaced out Indian influenced electronic dance outfit headed up by Ralph "Rudra" Beauvert, with help from Enzo Lopardo on percussion and Stephan Thelen playing guitar on one track. Based in Switzerland, Ralph came to my attention as Phil Jones' partner on the Shiva Shakti CD (see Phil Jones article and reviews this issue). 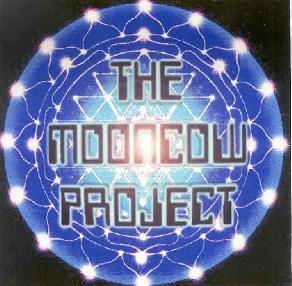 Imagine a combination of Ozric Tentacles, Gong, space ambient, pounding dance rave beats, and Indian inspirational influences and you've got something like The Mooncow Project. Ralph is a whiz with the keyboards and even at it's most dancey the music is replete with freaky bubbling and shooting space synths and varied electronic patterns. Songs like "Kashmir (By Godsight)" are like the Ozric Tentacles playing a rave. A thudding electro dance beat is accompanied by beautifully freaky UFO synths and male and female vocalists doing Indian styled chants. "Namaste" is similar but with some melodic prog rock sounding keyboards. "Take A Deep Breath" follows in this mold, but is the most purely dance oriented song of the set. Heavy driving rave music for dancing until the wee hours of the morning. "Dao" and "Moo'N'Cow" are more subdued tracks that I really enjoyed. The former features spacey Tangerine Dream keyboard textures, wild and freaky synths, Eastern percussion and chants, and a powerful symphonic vibe that gives the music a prog rock feel. "Moo'N'Cow" is still dancey but the rhythms are quirky and complex. I like the combination of melodic and ambient bits with the shooting space synths, and there are hints of jazz scattered throughout as well. "Mahadeva" is a dancey electro tune that is similar to Indian pop music but the synths are far more varied and space freaky. Ralph excels at layering multiple synth patterns to create an accessible whole that nonetheless offers a variety of complexity and fun for those who like to pick apart the layers under the headphones. "Tune In" is similar but has more of a structured song feel. In fact, this sounds to me like a more dance oriented version of Gong, complete with Daevid Allen styled chanting vocals. "Nandi" includes floating atmospheric space electronica with the addition of Indian chanting vocals. And despite its calm meditative feel, Ralph still manages to pepper the proceedings with a parade of frenetic synth bits. Finally, "All & Everything II" begins as a spacey Tangerine Dreamy sounding piece, but is actually a synth-pop song. It's a very good tune because Ralph doesn't dumb down the cool synth work for the sake of the song's accessibility. And the song is embellished by some excellent whining Robert Fripp type guitar licks. In summary, The Mooncow Project takes dance music as its foundation and adds Indian influences along with skilled and creative synth work to create an excellent space freaky roller coaster ride. Recommended. For more information you can visit the Mooncow Project web site at: http://www.mooncowhq.ch/Mooncowhq/mooncowhq.html. There you'll find information on Ralph's various projects including the Shiva Shakti CD he's done with Phil Jones (ex-Quintessence vocalist). CLICK HERE to read the review/interview with Phil Jones, including a review of the Shiva Shakti CD, in this issue. Or CLICK HERE to return to the main Aural Innovations page.